The scientific presentations are usually in oral or poster form. Recently evolved methods are video and “e-poster” presentations. Video data and images can be presented in oral presentations but for a limited time. The presentation time is prolonged in poster technique and available for more people but video data can’t be presented. The video presentations and e-posters are uploaded and ready to be selected through a menu in few computers because of the lack of available number of computers for every study. The interactive posters make the presentation of numerous images and video data to be accessible continuously during whole meeting period via its special screen. We aimed to increase sharing of knowledge and make it interactive during a limited period. 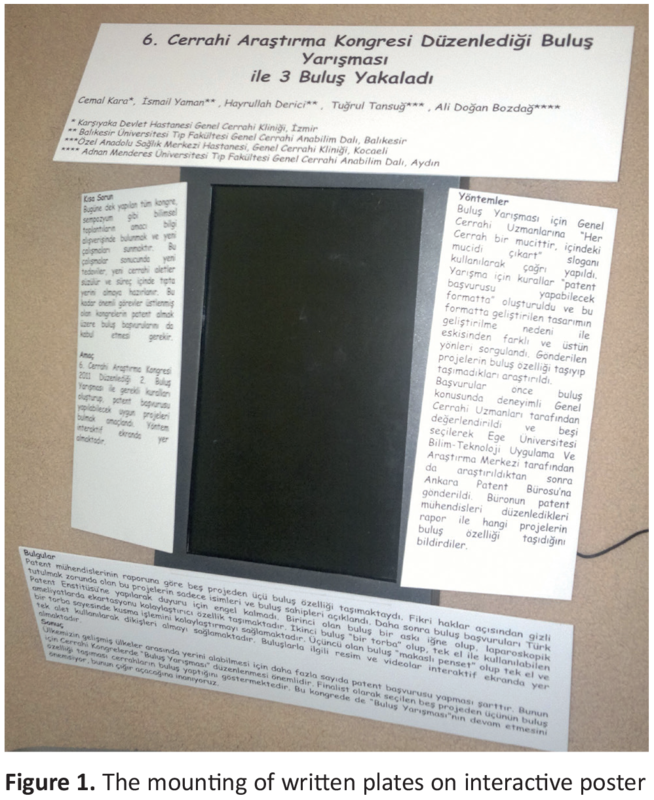 A 23-inch touch screen with a data processor was used for poster presentation. The special screen was provided for participants to read text, multiple images and video data continuously. The data processor was set to count the number of people to touch screen to read the presented study during the congress period. 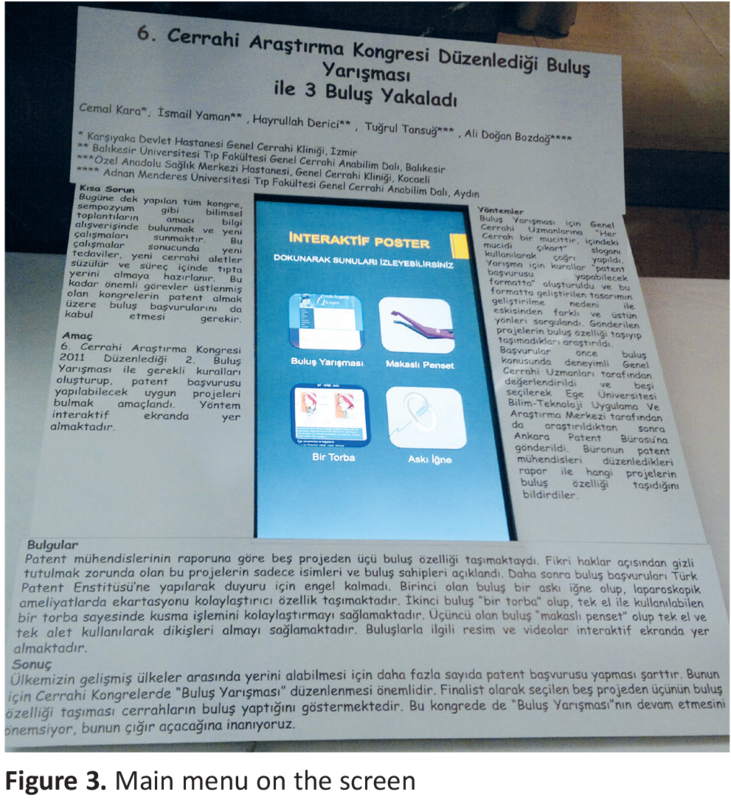 The interactive poster was set to be ready in 7th Congress of Surgical Research. The continuous presentation was lasted all through the 3-day Congress Period and 938 clicks were counted by the processor. During a congress period, by touching the interactive screen it was possible to interchange between the menu topics. The software counting the clicks need to be developed to estimate the number of people evaluating the study as well as duration of interest and which image and video data were evaluated at most. The presentations in scientific meetings are generally in two different methods: oral or poster (1-3). Video presentations and e-poster methods are also included recently. All of these methods have some advantages and disadvantages. Oral presentations are accepted relatively less in number but are better in presenting a topic with comparatively superior visual material (2,4-6). However, oral presentations need 10-15 minutes to go and limited to the number of audiences in the room. Video presentations are generally effective for discussion on surgical techniques. E-posters are presented in digital media. The last two presentation techniques need a specific monitor and operating system. Anyone choses a video presentation or e-poster within a topic list waiting in stand-by state. This method obviously requires an expensive technical infrastructure. Posters have no oral speech or video presentation but they are visually enriched by means of images and graphs. A poster is available throughout the meeting period and may reach comparatively higher number of participants if it is interesting enough (2-6). The advantages and disadvantages of various presentation methods are summarized at Table 1. A new method of presentation arises when the advantages of these four methods are to be combined. Video poster method is designed to fulfill this need has more advantages than other presentation method (Table 1). Video poster method has found to be successful since 2007 (1,2). Encouraged by winning awards for presentation in National Congress, it was also used in other national and international meetings and found to be interesting and awarded (2). The portable DVD player in early presentations was replaced by a digital frame because it was assembled easier behind a poster (7). Later, mounting a digital frame in front of a poster was found to be even more easy and faster (8). The interactive poster (IP) method is the last derivation of these methods. A data processor with touch screen monitor will be assembled on a poster. Digital data like text, many images, tables, graphs and video footages of a study will be uploaded to IP. Any participant will achieve any data, examine images and watch videos just by touching screen. If this presentation technique is widely accepted, more and various visual data will be included and common interest to poster area will be higher. This situation would serve to share and produce more knowledge. A data processor with 23” touch screen monitor on a portable pole was prepared and placed in poster hall at the congress center. The written plates about the headlines of the study were mounted along the circumference of screen and placed in poster area (Figure 1). The subject of the IP was the awarded innovations in 6th Surgical Research Congress. There were four main menus on the screen. First one was a slide show describing rules, evaluation and selection criteria of the jury of innovation contest. The other three menus were assigned to the awarded three innovations each. The specifications, technical drawings, images and videos of prototypes of the innovations to be used for patenting applications were uploaded. Any participant was free of achieving data of desired study by selecting menu on the screen. The data processor recorded the number of all clicks on the menu. Since this study is a work of presentation technique approval of local ethical committee and patient consent form was not necessary. 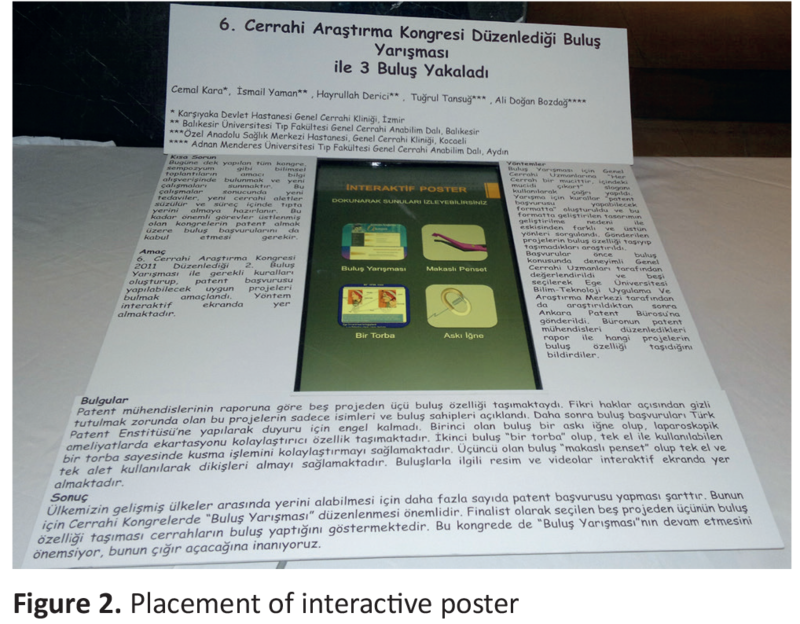 During November 7-9, 2013 period, the assembled IP was uninterruptedly presented at the 7th Surgical Research Meeting in Ankara (Figure 2, 3). All along the meeting period, the participants could reach the desired data. There were 938 clicks during this period. The poster presentation area is generally visited less relative to other activities of the meeting by participants. Limited visual contributions could make a poster monotonous and cause decreased attention (1). A video poster presentation with its enriched visual properties, continuity and low cost is an original work exposing dynamism (1,2,7). The presentation impact of a video poster is improved more by adding interactivity. During this congress period, the number of clicks on this poster was counted as 938. Previously, there is no reported study to measure the rating of e-poster presentations. This improvement comes from technological improvements. When the software is upgraded, it will be possible to know the number of participants examining a specific text, image or video. Then, it would be easier to get feed-back of the participants and the researchers would be directed accordingly. We think that the IP presentation includes and enhances video and e-poster methods and the finding supported our idea. IP presentation will revive the poster areas of the meetings and may help to transfer more knowledge than previously. Additionally, the work inside the IP can easily be transferred via internet. In future, other presentation methods will be replaced by IP technique. Since it’s the early era of this technique, the published articles on this method can make IP gradually be acceptable more. Any knowledge increases when it is shared more and faster. Ethical Committee Approval: Since this study is a work of presentation technique approval of local ethical committee and patient consent form was not necessary. Informed Consent: It was not necessary. Concept: A.D.B.,Design: A.D.B., Ş.B., Data Collection or Processing: A.D.B., H.E., Analysis or Interpretation: A.D.B., H.E., Literature Search: A.D.B., A.S., Writing: H.E. Financial Disclosure: This study was financially funded by Adnan Menderes University. Bozdağ AD. Bilimsel toplantılar için faklı bir sunum tekniği: Video-poster. Endoskopik-Laparoskopik ve Minimal İnvaziv Cerrahi Dergisi 2006; 13: 162-6. Bozdag AD. A new technique for presentation of scientific works: video in poster. World J Surg 2008; 32: 1559-61. Halligan P. Poster presentations: valuing all forms of evidence. Nurse Educ Pract 2008; 8: 41-5. Desilets LD. Poster presentations. J Contin Educ Nurs; 2010; 41: 437-8. Desbiens NA. A departmental experience in promoting oral and poster presentations. Teach Learn Med 2008; 20: 254-60. Dahllöf G, Wondimu B, Maniere MC. Subsequent publication of abstracts presented at the International Association of Paediatric Dentistry meetings. Int J Paediatr Dent 2008; 18: 91-7. Bozdağ AD, Bozdağ KE, Soyder A, Aksu M. Comparison of videoposter presentation technique with other presentation techniques in congress. İzm Üniv Tıp Derg 2014; 1: 1-6. Bozdağ AD, Bozdağ KE. A Different Presentation Technique; Videoposter. öInternational Journal of New Trends in Arts, Sport &Science Education. 2012; 1: 25-9.